I have been in a whirl wind of change. I moved from San Francisco to the suburb of Lafayette, and then I got on a plane to Japan. At the moment it is 7 am in Tokyo and I am sitting down in line to see an all day Sumo match. If anyone has contacts in Japan that they would like to introduce me to, please send me an email. If you are in Japan and you want to meet up, same. If you happen to know of something particularly cool or weird to do, particularly in Tokyo or Kyoto, I’m all ears. The report on radiation: There is none in Tokyo, we brought a Geiger counter from home and it shows no change. Second, the abundance of cheap delicious food is overwhelming...in Japan there is no sales tax, and no tipping and my American Express card is not charging for currency conversion. Sarah is at my side playing angry birds, we are in need of coffee and snacks but we must sit here for one more hour before the tickets are handed out. 1. I would like to see what Sumo was like before the spread of Fascist movements in the early 1900's. Was it more or less theatrical? comic? 2. Are the Sumo guys meant to be Cosmic Babies? I ask this because Tangki in Taiwan are often seen that way and the defining characteristics are sometimes said to be bare feet, bare chest, and bib (They wear two kinds of bibs in Sumo, a fighting one and a ceremonial one.) When baby or child deities are made into icons or puppets or actors in China, they also have these characteristics. 3. I was reminded of Indian Monkey wrestling several times. The "dirt" that gets watered and swept at regular intervals on the Sumo stage has similarities to the 'dirt' that gets mixed with gee and nice smells and gets shoveled into even softness in the Indian wrestling temples between fights. Also a Sumo guy did a bow (as in bow and arrow) dance at the end which looked a lot like a monkey king spinning a staff. 4. Between each fight there a singer comes out and does a short dance with a fan, it looks closely related to the Shimai (Noh Dance/Drama interludes) I studied at Oomoto 23 years ago. So does the officiated Shinto priest's vocalization and movement. 5. The wood clappers are used at certain times, for theatrical effect? 6. I believe there was a ritual in which each match was formally announce. It seemed like the reading of imperial decrees. 7. 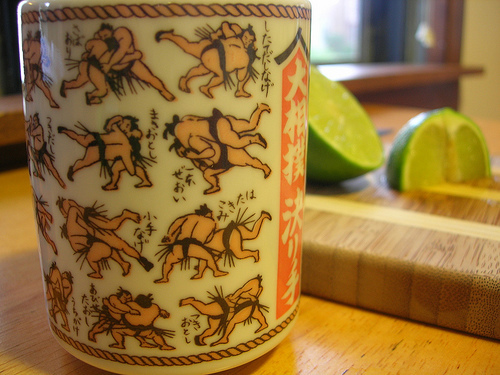 I have heard from several sources that the Japanese do not think Sumo and Mongolian wrestling are related. I heard for instance, that the squat dance they do with their arms out to the sides, hands together than up then down, is to show that the wrestler has no weapons. But it looks a lot like a version of the Mongolian eagle dance. (check Youtube) Also the side balance with one leg up in the air and then coming down with a heavy stop looks just like Mongolian wrestling. As a demonstration of prowess it has a lot in common with the stamps in Chen Style Tai Chi too. Maybe Mongolian wrestling came from Sumo? 8. I really appreciated all the dancing and posturing and throwing salt and slapping and grunting. It really gave me a chance to see who was likely to win and why! Especially when looking at the early junior matches-- the (not)-eagle dance instantly let me know if they had good shoulder integration which is key to winning. The squat let me see head integration and uprightness, and the four legged prone posture let me see if they had any spine problems. Later in the show when they started reaching for and then throwing salt, they sometimes really looked like gorillas. We've got tickets to Kabuki...so I gotta run.